Joseph and Irene Kiss, both of Hungarian decent, were born in Romania. Alone and afraid, Joe immigrated to The United States on 1930 at the age of nine, while leaving behind his mother and brother. He was at Ellis Island for two weeks before joining his father. Irene immigrated to Canada in 1932 at the age of nine. Accompanied by her mother and brother, Irene soon rejoined her father. After being discharged from The United States Air Bourne in 1946, Joe went to work as a bartender at The Walnut Hills Bar (now Tanks) on Wayne Avenue in Dayton, Ohio. The bar was owned by Irene’s aunt and uncle. Irene came to visit them and this is where she met Joe. They dated, fell in love and married six months later on February 8, 1947 at Sacred Heart Church in Windsor, Ontario, Canada. They had three daughters: Jo Ann, Shirley and Margo. Joe and Irene owned several bars and a grocery store through the years. 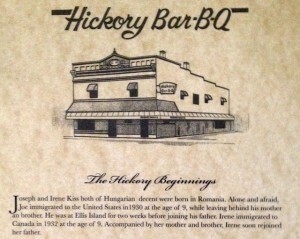 In 1962, they went into ownership with Irene’s brother Steve Kolb and wife Sylvia; forming The Old Hickory Bar-B-Q on Brown Street. Steve and Sylvia owned the original Old Hickory Bar-B-Q on Third Street and later the one on Main Street and The Woodman Carryout. Joe and Irene bought out Steve and Sylvia in 1989 at The Brown Street location. They changed the name to Joe Kiss’s Hickory Bar-B-Q. Joe and Irene worked hard together; bartending, waiting tables and preparing food such as the cabbage rolls, etc. By the way, the Hungarian cabbage roll recipe is Irene’s mother’s. Joe and Irene were married 49 years before his death in 1995. The restaurant continued as a Kiss family owned restaurant with Irene Kiss, Don and Jo Ann McGlone, Shirley Teague and Gary and Margo Fisher. All of the daughters, husbands and seven grandchildren have worked at The Hickory throughout the years.